Rich Hall, star of critically acclaimed BBC 4 documentaries such as Rich Hall's California Stars brings his grouchy, deadpan comedy style to The Maltings im Berwick on Saturday, October 1. More details below. The Lamp Post Petition. The Maltings, Berwick, 8pm. This is a piece that spreads from a small village in Italy to Southern Ireland, to Leister. From Retford to Mansfield, to Limerick, to Texas, to Newcastle, and back again. Tickets are free, but places must be booked in advance on 01289 330999. How to Make A Killing in Bollywood. The Maltings, Berwick, 7.30pm. This is a new musical comedy about two best friends who decide to quit their jobs in a fast food restaurant and head to Bollywood in search of fame and fortune. Tickets: £12.50, concs £10 for disability, student, unemployed, concs for over 60s £11. Rich Hall: Live 2016. The Maltings, Berwick, 8pm. Rich Hall’s critically acclaimed, grouchy, deadpan style has established him as a master of absurdist irony and the king of rapid-fire wit. The award-winning Montana native, who is renowned for his expertly crafted tirades, quick fire banter with audiences and delightful musical sequences, saddles up and hitches his wagon to tour the British Isles once again. Tickets: £16, plus £1 refurbishment contribution. Bridget Jones’s Baby. Alnwick Playhouse, 7.30pm. For once, Bridget Jones has everything completely under control and is focused on her career as a top news producer, until her love life takes centre stage once more when she discovers she is pregnant. Tickets: premier £7.80, standard £7.50, concs £7, child/student £5.50, friends £6.75. Certificate (15). Swallows and Amazons. The Maltings, Berwick, 7.30pm. Set against the breathtaking backdrop of the Lake District, Swallows and Amazons is a heartwarming adventure for all the family. Tickets: £7.45, concs £6.45, child £4.45 (16 and under), baby free (two and under). The BFG. Alnwick Playhouse, 3.30pm. A young orphaned girl call Sophie is carried away to a magical land by a giant who turns out to be a kind-hearted, friendly soul. Tickets: premier £7.80, standard £7.50, concs £7, child/student £5.50, friends £6.75. Certificate (PG). Cafe Society. Alnwick Playhouse, 7.30pm. Romantic comedy. Bobby Dorfman trades in his quiet New York existence for the excitement and bright lights of Hollywood in a bid to rival the dramatic gangster lifestyle of his brother. Tickets: premier £7.80, standard £7.50, concs £7, child/student £5.50, friends £6.75. Certificate (12A). Glendale Accordion and Fiddle Club. Glendale Hall, Wooler, 7.30pm to 11pm. Guest artists Alan Small and the Gemma Donald Quartet. Joining fee £8, members £5, visitors £6.50, including buffet. Hungrytown. The Queen’s Head, Rothbury, 8pm. Vermonters Rebecca Hall and Ken Anderson, who make up Hungrytown, will be performing in Rothbury and Alnwick to support their latest album, Further West. Tickets: £8. Open Mic Night. The Tanners Arms, Alnwick, 8.30pm. Warkfest. Warkworth Cricket Club. In aid of Cancer Research UK, local bands and artists will be playing throughout the night in the club or marquee. Tickets £7.50 at the village shop. Pooh’s Hums. Alnwick Playhouse, 11am and 1pm. A chatty sing-song for fans of song and Winnie the Pooh, created by pianist Yoshie Kawamura. Tickets: £3.50. The Three Degrees. Alnwick Playhouse, 7.30pm. The Three Degrees are an American female vocal group, formed in 1963 in Philadelphia, Pennsylvania. The group has remained a trio with two original members since Sheila Ferguson left many moons ago. Tickets: premier £24.50, standard £23.50. Little Red Riding Hood & The Three Little Pigs. Alnwick Playhouse, 6pm. Critics Circle award-winning company Ballet Cymru present an extraordinary vision, two stories from the mind of the most popular storyteller in the world, Roald Dahl. Tickets: premier £17.50, standard £16.50, concs £15.50, child/student £11.50. Folk Sessions. Blue Bell Hotel, Belford, 8pm. All welcome. Andy May Trio. Coquetdale Music Trust, Thropton, 7.30pm. The Andy May Trio play high energy, instrumental folk, inspired by the music of their native North East. Tickets: £10, free for under 14s. Pay on the door. Ralph McTell. Alnwick Playhouse, 7.30pm. Ralph McTell celebrates 50 years as a professional musician and this quintessential English singer-songwriter-guitarist is back on tour. Tickets: premier £22, standard £21. Rothbury Accordion and Fiddle Club with The Occasionals. Queen’s Head Hotel, Rothbury, 7.30pm. Members admission £4, non-members £5. Musicians and visitors welcome. Contact 01668 281307. Red Moon Road. Cheviot Centre, Padegepool Place, Wooler, 7.30pm. Canadian folk song, masterful storytelling and repartee. Tickets: £9, concs £8, family £25, children £6. Available from www.highlightsnorth.co.uk or from the Cheviot Centre, Wooler, and by phone on 01668 282406. Joy of Jive. Felton Village Hall, 7.30pm. Joy of Jive classes of modern jive are continuing in full swing, and they will continue to teach in the hall every other Thursday evening. Beginners are welcome and partners are not necessary. Berwick Arts Choir. Reformed Church, Spittal, 7.30pm. A varied programme of choral music has been planned for 2016/2017. Singers in all sections of the choir will be made welcome – no audition is necessary. Gateway drop-in. Shilbottle Community Hall, from 10am to 4pm. A free drop-in to meet friends over refreshments, play cards, read newspapers, watch television or use the internet, and in the afternoon join the craft group. Learn to dance ballroom and Latin. A class for absolute beginners. Every Thursday at Marshall Meadows Country House Hotel, at 7.30pm. £2.50 per person. For further details, call 01289 307953. Tea Dance Group. Hadston Community Centre, 1.30pm to 3.30pm. Admission of £1.50 includes a cup of tea or coffee and a biscuit. Dance tuition is free. Bible Meeting. Hindmarsh Hall, Alnmouth, 7.30pm to 8.30pm. The purpose of these meetings is to impart faith to those who have no faith, to restore faith to those who have lost it, and to strengthen the faith of those who have it. Modern and sequence dancing. St Aidan’s Hall, Church Street, Berwick-upon-Tweed, 8pm to 11pm. Entry is £3, which includes tea or coffee and biscuits. Car Boot Sale. Castlegate Car Park, Berwick, Sunday morning. The event is run by the Greenses Residents’ Committee in aid of local charities. North East of England & Scottish Borders Begonia Society. Dinnington Village Annex (by Newcastle Airport), 2pm. The aim is to pass on any information regarding the growing of these beautiful plants that will flower for four months at least. All are welcome. Floral Art Club Reunion. Castle Hotel, Berwick, 12.30pm. Berwick and District Floral Art Club is holding a reunion and buffet lunch. Charge £5. All ex-members are welcome and can contact Val on 01289 302398 or Linda on 01890 771731. Alnwick and District Flower Club. Costello Centre, Bailiffgate, Alnwick, 7pm. Autumn Workshop: Fern Floristy. The Downies from Glen Isla. Bailiffgate Museum, Alnwick, 7.30pm. Hear how a fascinating family history was uncovered. Free to enter, open to all. Refreshments provided. Donation invited for Alnwick Branch NDFHS funds. Creative Cocoon - Tots. Alnwick Playhouse, 10am. Join us with your little ones in our warm, welcoming environment specially designed for little ones to play and create. Tickets: standard £4. Exhibition by Artist Helen Poremba. Gallery 45, Felton, 10am to 5pm. Living and working just minutes from the gallery in Main Street, Felton, Helen uses free motion embroidery, along with scraps of material, to depict beautiful, detailed botanical studies. All attraction opening times may vary from season to season. Alnwick Castle: 01665 511100. Go to www.alnwickcastle.com for opening hours and further details. Alnwick Garden: 01665 511350. Go to www.alnwickgarden.com for opening hours. Prices are £12.10 adults, £10.45 concs, £4.40 children, £29.70 family. Bailiffgate Museum, Alnwick: 01665 605847. Open Tuesdays to Sundays 10am to 4pm. Admission is £4, £3 concs, £1 children, under fives free. Bamburgh Castle: 01668 214515. Open daily, from 10am to 5pm, last admission 4pm. Admission £10.50, £5 children, £10 senior, £25 family. Barter Books, Alnwick Station: 01665 604888. Open daily, from 9am to 5pm. Belford Hidden History Museum. Open daily, from 10am to 4pm. Free admission. Belsay Hall, Castle and Gardens: 01661 881636. Open daily, from 10am to 6pm. Admission £9.20, £8.30 concs, £5.50 children, £23.90 family. Berwick Barracks: 01289 304493. Open 10am to 6pm, seven days a week until end of September. Admission £4.80, £4.30 concs, £2.90 children, £12.50 family. Chillingham Wild Cattle Park: 01668 215250. Open Monday to Friday: Tours at 10am, 11am, noon, 2pm, 3pm, 4pm. Sundays: Tours at 10am, 11am, noon. Closed Saturday. Admission £8, £6 concs, £3 children, £16 family. Cragside House, Gardens and Estate: 01669 620333. Closed Monday. Open Tuesday to Sunday, house 11am to 5pm, gardens and woodland 10am to 6pm. Admission £10.20, £5.10 child, £25.50 family. Dunstanburgh Castle: 01665 576231. Open daily, from 10am to 6pm. Gift aid admission: £4.90, £4.40 concs, £2.90 children, £12.70 family. Edlingham Castle: 0870 333 1181. Open any reasonable time during daylight hours. Admission is free. Etal Castle: 01890 820332. Open daily, from 10am to 6pm. Gift aid admission: £4.80, £4.30 concs, £2.90 children, £12.50 family. Heatherslaw Cornmill: 01890 820488. Open daily, from 10am to 5pm. Admission £3.80, £3.20 concs, £10 family, under fives free. Heatherslaw Light Railway: 01890 820244. Open daily, from 10am to 4pm, first train at 11am. Return journey prices: £6.50 adult, £6 seniors, £4.50 children, £2.50 under fives, babies free. Heatherslaw Visitor Centre: 01890 820338. Open daily, from 10am to 5pm. House of Hardy fishing tackle museum. Willowburn, Alnwick. Telephone 01665 510027. Open Monday to Saturday, 9am to 5pm. Free entry. Howick Hall Gardens: 01665 577285. Open daily, from 10.30am to 6pm, last entry 5pm. Gift aid entry £7.70, £6.60 over 60s, children free. Lady Waterford Hall, Ford: 01890 820338. Open daily, from 11am to 5pm. Admission £3, £2.70 concs, £8 family, under fives free. 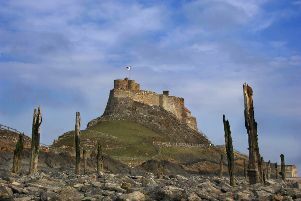 Lindisfarne Castle: 01289 389244. Call for opening times. Gift aid admission: £7.80, £3.90 child, £19.40 family. Lindisfarne Centre: 01289 389004. Call for opening times. Admission £4, £3.50 concs, £2 children, £10 family, under five’s free. Lindisfarne Priory: 01289 389200. Open daily, from 10am to 6pm. Gift aid admission: £6.20, £5.60 concs, £3.70 children, £16.10 family. North Charlton Armstrong Household and Farming Museum. 01665 579443. Open every Friday on the Chillingham Road, off the A1. All proceeds go to charity. Preston Tower, Chathill: 01665 589227. Open daily, from 10am to 6pm, or dusk, whichever is earlier. Admission: £2.50 children, £1.50 concs or groups. RNLI Grace Darling Museum, Bamburgh: 01668 214910. Open daily, from 10am to 5pm, last entry 4.15pm. Free admission. Wallington: 01670 773600. Stately home near Cambo: Open Thursday to Monday, and Wednesday, from noon to 5pm. Closed Tuesday. Walled garden: Open daily, from 10am to 7pm. Garden and estate: Open daily, from 10am to dusk. Gift aid entry: £12.60, £6.30 child, £31.50 family. Warkworth Castle and Hermitage: 01665 711423. Castle: Open daily, from 10am to 6pm. Gift aid entry: £6, £5.40 concs, £3.60 children, £15.60 family. Hermitage: Open on Sunday and Monday only, from 11am to 4pm. Admission £4, £3.60 concs, £2.40 children, £10.40 family. Woodhorn Museum and Archives, Ashington: 01670 624455, Queen Elizabeth II Country Park, Ashington: Open Wednesday to Sunday, from 10am to 5pm. Northumberland Archives: Open Wednesday to Saturday, from 10am to 4pm.